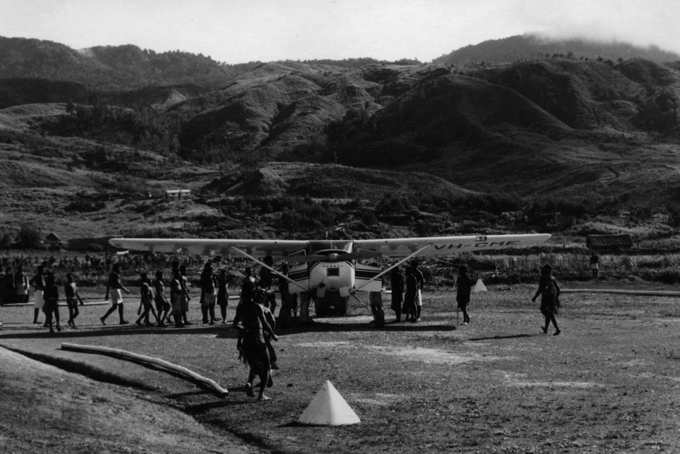 Simbai, an outpost of the Australian Administration, was linked to the outside world by an airstrip and a two-way radio. 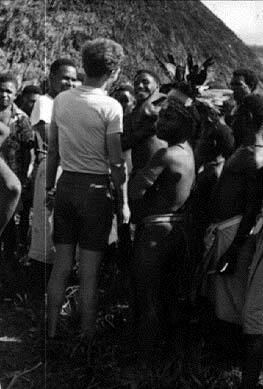 It was the location of an Anglican Mission Station and a Patrol Post, manned by an Australian patrol officer and a number of Papuan policemen. For the Maring of the Simbai Valley, it was the gateway to the world of the "Europeans." For us, it was the gateway to the Maring world. We were met by Kavali, Skip Rappaport's intrepreter and research assistant, and a group of Maring men who, at Skip's suggestion, had come to help us with our cargo. They had walked for a whole day to get to Simbai. "I was just overwhelmed by the number of people who came to greet us and help us with our cargo. And I had difficulty understanding why they were so helpful, friendly, and out-going to someone they had just laid their eyes upon for the first time. They had no idea what kind of a person I was or how I felt about them." Allison: "They were curious to meet us, for, up until then, very few 'Europeans' had been in the area. I was only the third white woman to be going into Maring territory in the Simbai Valley." The men also did not want to pass up one of the rare local opportunities to earn money: by carrying our cargo. 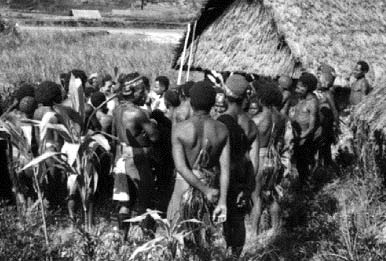 These Maring men were as much strangers to the Simbai Patrol Post as we were, for the patrol post was in Karam territory, and was a day's walk from the boundary of Maring territory. The Maring men had no relatives or trading partners in Simbai who could offer them hospitality. 001-24: Digging sweet potatoes for the evening meal. Kavali, who spoke Maring, Pidgin English, and English, as he had studied at an agricultural college, helped us to make the necessary arrangements for them. They would sleep in the haus passenger, a large, empty thatched shelter provided by the patrol officer for people coming on business from distant parts of the district. 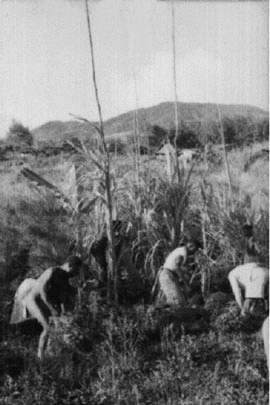 As for food, Kavali suggested that we ask the police for permission for the men to harvest some sweet potatoes and green vegetables from the gardens which the policemen's wives cultivated. We ourselves had been invited to stay overnight at the Anglican Mission station. Early next morning the plane bringing our cargo came in. Planes coming into Simbai had to arrive before 10 a.m. After that, clouds would close in for the day and the pilots could not see the airstrip. The planes could take off from the Madang airport and land in Simbai with a load of 1,300 pounds - including the weight of passengers. 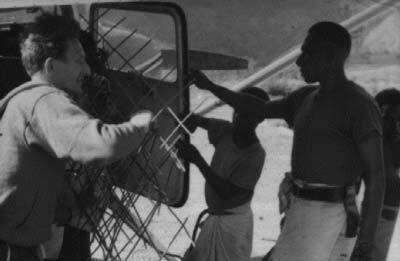 But, because the airstrip in Simbai was short and sloping, the same planes could only take off from Simbai with loads not exceeding 500 pounds. "On the Cessnas you had two limits as far as sending things. One was weight, and one was volume. The people who were doing the loading didn't know how to load: from the point of view of weight, one often could have loaded in more; but from the point of view of volume, they had filled the belly in such a way that nothing else would fit in. The belly had a funny shape: smaller things had to go into each end. Once I had seen that, I would help load whenever I was present, directing which items went in first and where." Once everything was unloaded, the Maring men repacked our cargo into one-man and two-man loads, so they could carry all the things that we had brought in with us. Then we all set off for the long walk on the path which started between the airstrip and the grass-covered, high altitude hills surrounding Simbai. 240-22: Our cargo is carried along the path at the edge of the Simbai airstrip. 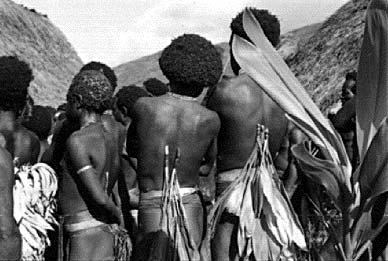 "A short time after we got to New Guinea, I heard various 'Europeans' talking scornfully about 'cargo cults.' I nearly died laughing. It was the 'natives' who had the 'cult,' but it was us 'Europeans' who couldn't do without dozens of carriers to carry our belongings when we walked from one place to another."